You’ve undoubtedly seen the image of the Taj Mahal numerous times, but still, nothing can compare you for your first real-life glimpse. With pure excitement that morning in Agra, I woke up with the roosters, determined to arrive before thousands of additional visitors joined me. It was my first time in India. After I passed through the turnstile, I sat on a bench in front of the reflecting pool, watching how the light changed the marble’s color. From a shrimp-colored morning glow, to a bathed-in-sunlight look, it was magnificent! I can see the resemblance too, Christina! I read that the Taj is a prime example of Mughal architecture (which has Persian, Indian & Turkish ingredients all blended together). Virginia, I actually snapped these shots during my first trip to India in my pre-hubby days. :) He and I didn’t get a chance to explore the north during our most recent trip, but it’s a spot I hope to return to with him sometime soon! 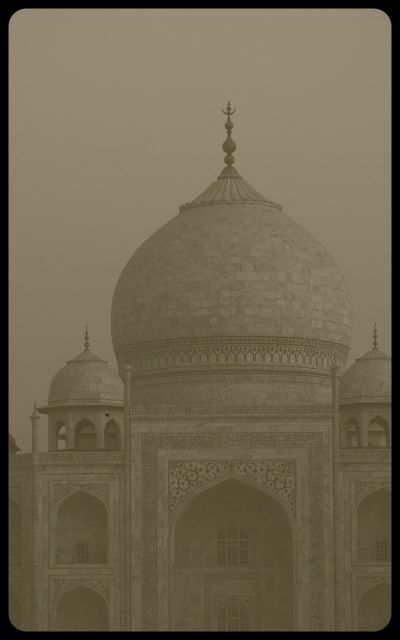 The last photo Tricia; what a beautiful way to see the Taj Mahal! Your corn story is very cute; the Corn Palace! Also a great way to escape the heat in the shade of that beautiful archway! 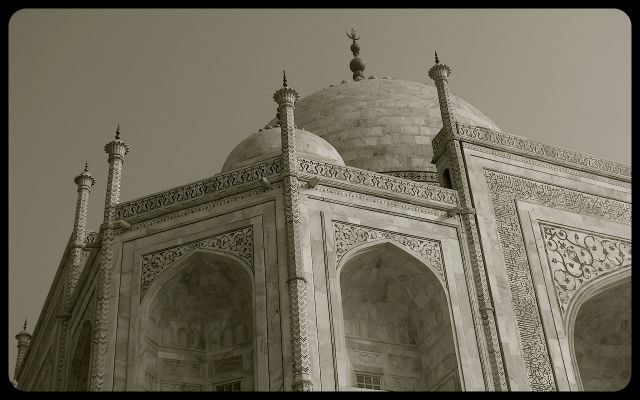 I agree that photos just don’t compare to seeing the Taj in person. It is a brilliant architectural manifestation of a husband’s love for his late wife. Hopefully it lives up to the Corn Palace. Great photo’s Tricia and lovely story to go with it, thanks. A gorgeous series of shots. I think the sepia works very well. And you did the right thing getting there so early! Yulia, thank you! 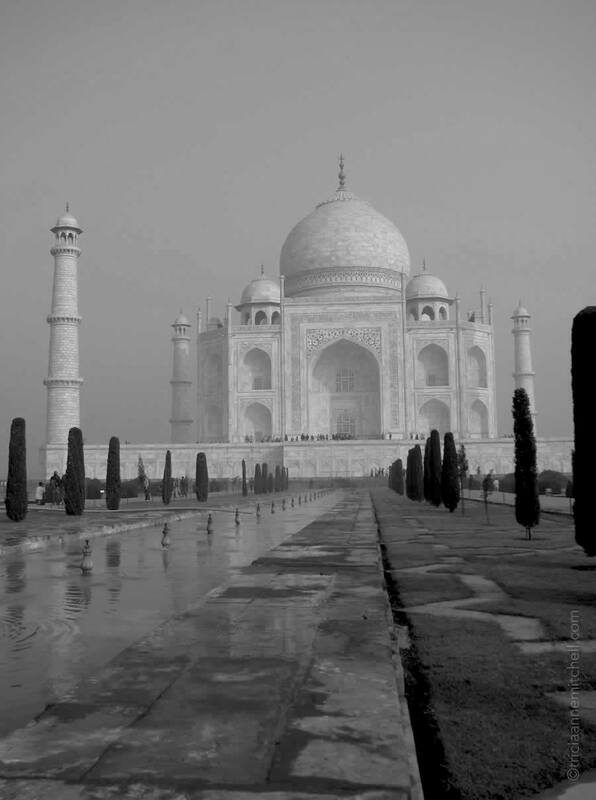 I cannot recall – did you make it to Agra on your recent trip? Gosh, how I miss Indian food. Yesterday we bought some colorful lentils and dressed them in a curry sauce, trying to replicate the yummy dhals. These photographs are particularly beautiful! When you have such a wonder in your own country, you often take it for granted, but now I see that I must visit it soon. Thank you, Ruth! Agreed about sometimes taking our own wonders for granted. I haven’t been out to truly explore the American west since my “Corn Palace” trip. :) I’m looking forward to seeing more of my home country’s wonders. Yes, it proves tricky taking visitors around Bombay sometimes. Did you receive my email? Hi Ruth, yes I did! I just sent a reply back this afternoon. Hope you are enjoying Kerala! I’ve been to the Corn Palace too! Great pics! Someday I’ll make an adventure to India, but first I’ve got to finish with China. Kevin, are you in China now? Ay pointers on must-see spots or regions? We’re hoping to make it there soon. Tricia, yep, I’m in China now, but only for another month. Of course there are the big places and things to see like Beijing with the Forbidden City, Summer Palace and the nearby wall. One of my favorite places has been Yangshuo just outside of Guilin in Guangxi Province. In a few weeks I’ll be traversing all over the country before I head home with visits to Sichuan and Gansu. You can check out my blog to get ideas for places to visit. Best wishes with your traveling. Enjoy the rest of your time there, Kevinearl, and thanks for sharing your favorites with me. I will definitely refer to your blog for some place pointers. All the best! 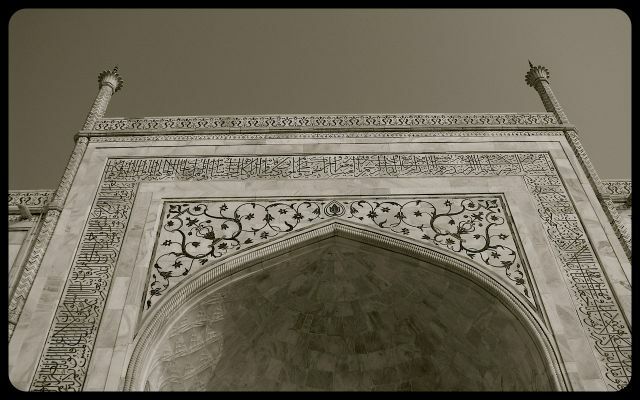 Taj Mahal is absolutely breathtaking! And these pictures, equally so! How much have you seen India? Your website is great! You seem such a beautiful person. Love and wishes from India. Greetings, Shruti and thank you! I’ve seen a mixture of both north & south — the so called “Golden Triangle” (Delhi, Agra, Jaipur & Pushkar) and Mumbai, Munnar, Fort Kochi, and the Kerala backwaters… I tried taking a peek at your blog, alas, the link did not work. Perhaps you can send your most updated one. You’ve seen much of India. And Kerela is real beauty, ain’t it? Yes, the Taj is amazing at absorbing the light. Great story and connection with the Corn Palace! Hello Mark, my apologies for responding at such a snail’s pace – we’re on the road again, this time visiting family in North America. Peter, many thanks! 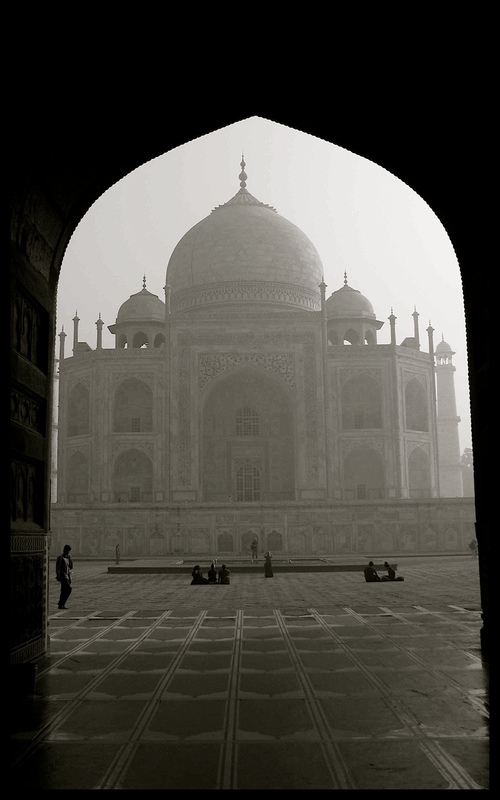 Visiting the Taj is a magical experience. I remember my wake up before dawn, which allowed me to watch the monument to love change with the morning light. AsiaDreaming, I’m glad that you have a contingency plan. :) It wasn’t long ago that we were in the Philippines awaiting our visas for India. It was well-worth the wait as we had quite a memorable month exploring the south of India. Where are you and your wife headed? Be sure to enjoy the fresh fruit from the street vendors in Bangkok, as it’s something you likely won’t be indulging in much in India. I’m salivating thinking of Indian dishes right now!